Editorial: This is the eighth of a series of reflection posts from Recipe Project contributors and editors. When we began this blog project in February 2013, we did not know where it was going to take us. We always saw our work with College of Physicians of Philadelphia Manuscript 10a214 as a work in progress, a work on progress. Given our different backgrounds and interests, we had a sense of the themes that may emerge, but in reading back through our collaborative endeavor, we can clearly see our efforts to locate the College of Physicians manuscript in time and place, but we also have seen how avenues of inquiry have permeable definition and numerous overlaps, can evolve and change. In particular, we have seen how working with recipe books requires a different sense of textual identity, that the individuals involved are not simply individuals – fixed identities tied to one lifespan and contained geographical boundaries – but rather entities that exist together as an interrelated network of being across time and space. After all, this is a do-si-do book: on one side a collaborator who seems to have died for the Parliamentarian cause, and on the other, likely a man who was imprisoned as a Royalist. There are two compilers, but to treat them as being in binary opposition is misleading. Furthermore, extending these political differences to their wives and mothers, named as authorities and owners of the book, would be a mistake. There are also numerous people who probably never saw the book but who nonetheless are cited within it and who therefore influenced its creation. How these voices came to be captured within one collection is part of its mystery, but it is clear that these disparate elements are not oppositional, but rather in conversation with each other. The result is a multivocal, overlapping mixture of concerns. To say that the two of us are working in a binary structure is also a temptation, with Rebecca concentrating on the textual history and Hillary working from a different angle on the geopolitical history. But this is not actually true. 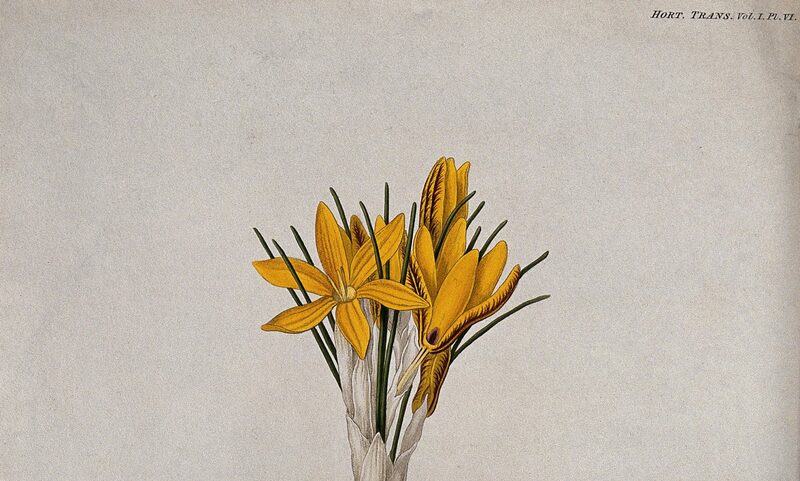 Looking at source material, from John Gerard’s Herball to Lancelot Andrewes’s Private Devotions, and imagining recipe exchanges between Anne Dacre and Elizabeth Downing illuminates a text that is many texts, spanning over a century of production, at once. Similarly, finding out more about those less famous people who contributed their recipe knowledge to the manuscript brings a different sense of how domestic practices were communicated outside of print in the time period. In the course of our research, which is indexed here, we have pursued timelines of personal history for those named in the manuscript (birth to death, marriage, children, and occupational appointments), religio-political history (particularly around the English Civil War), and textual history. While most of the relevant dates fall between 1606 (birth of Calybute Downing) and 1680 (death of Edward Layfield), the cross generational circulation of recipes and the staying power of print mean that the earliest associated dates extend well back into the 16th century and forward into the 18th. What we have discovered is that our seemingly separate topics are embedded in interconnected networks. Our efforts have helped us locate the text, but we have come to realize that we may never pinpoint it, and that doing so would be inaccurate and falsely stable. In fact, we have come to see that recipe manuscripts challenge that very desire for stability. Furthermore, our work has been influenced by a collection of other scholars and texts in a mode that no doubt mirrors the circulation that gave rise to the CPP manuscript. Numerous postings to the Recipes Project blog itself have leaked into our thinking – as have our monthly conversations with Early Modern Recipes Online Collective steering committee members. As a result, Elaine Leong’s name occurs several times in these postings, for example. But there are certainly conversations that we’ve had that have less clear-cut trails through our thinking as well. Attempting to trace these networks is at the heart of our collaborative efforts, even though there will always be elements that escape our recognition. This is not to say that we have made no progress in articulating the complicating connections embodied in the CPP manuscript. We have realized that, while we first hoped to discover how a Parliamentarian text fell into Royalist ownership, our terminology was unhelpfully confining. Instead, we now hope to articulate how people with such seemingly different views occupied the same, or overlapping, networks. In doing so, we hope to also complicates similar ideological categorizations that might hinder our readings of other texts. In the end, we may have to ask how the fluid nature of recipes and their circulation break apart/open the historicist project. Without the Recipes Project and the collaborative possibilities it offers, articulating these observations would have been far more difficult. Having the space, and opportunity, to report our research in increments has enlivened our project, allowing room for serendipitous discoveries in the archives, as well as in conversations with colleagues. Our work with the CPP manuscript has already taken us in some surprising directions, and our continued engagement with the text will no doubt bring other unexpected possibilities. And we can’t wait to report them all here in the coming months. Rebecca and Elaine both have written substantially about Lady Honywood (or Honeywood) in Recipe Project posts before. 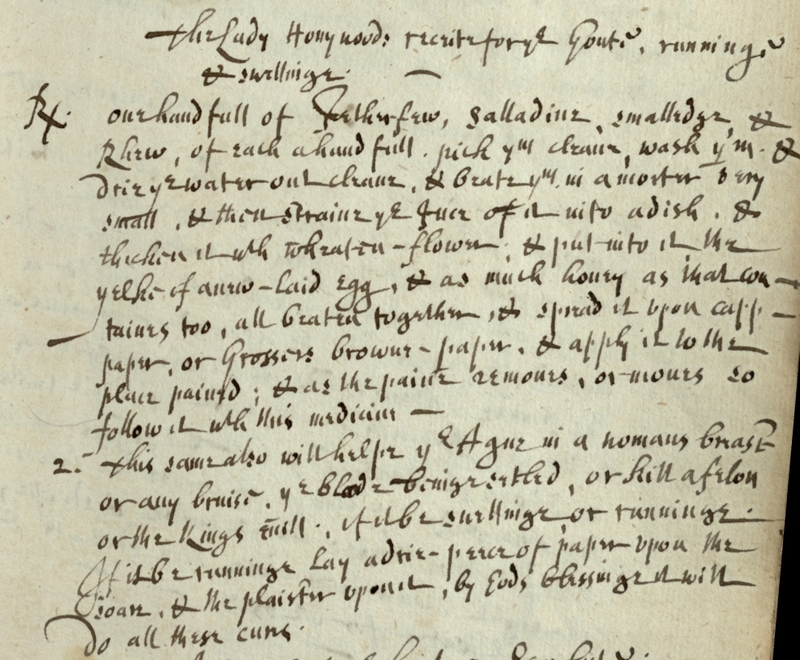 This past March, Elaine pointed out that Joanna St. John’s 1680 recipe book contains a remedy attributed to Lady Honeywood “for a cancer,” where the medicine is spread on paper and then laid on the sore. Not surprisingly, Lady Honeywood’s name rang a bell for me, since almost two years earlier, Rebecca had devoted two posts to Lady Honywood’s presence in the Layfield manuscript. Lady Honywood’s recipe for the gout, Rebecca showed, hinted that the compiler of the CPP manuscript’s second section had a particular need to treat that ailment since seven cures for gout appear there. The variation in recipe titles is not uncommon, of course, and it certainly highlights Rebecca’s point about the importance of local needs in the organization of these manuscripts. At the same time, it underscores how easily categorization schemes can obscure connections among texts and contributors. 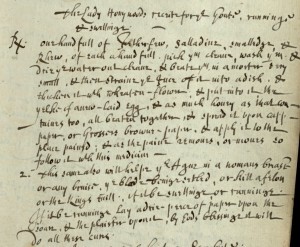 Lady Honywood and her recipe, variant title or no, forge a connection between two manuscripts, the St. John and the Layfield, that otherwise show no obvious overlap. And, ironically enough, a search for paper helped bring to light what had been an unidentified link within this very blog. The overlap between manuscripts, and the one between blog entries, hints further at what connections lie just beyond the reach of our current digital tools. Just more evidence that we need a searchable database of these manuscripts! or the Kings euell, if it be swellinge or runninge. In my last posting, I reported on a possible new match for the Layfield hand that appears in CPP 10A214. It looked so promising that my collaborator Rebecca Laroche and I immediately began exploring how a new identity for Layfield would change our understanding of the manuscript. If Edward Layfield, Archdeacon of Essex, was behind Hand 2, rather than Edward Layfield (rector of Wakes Colne) or Edmund Layfield (the first candidate we considered) what would that mean? A great deal, it turns out. Both letters bearing Edward Layfield’s signature carry the date 1660, and he is identified with the title Archdeacon of Essex in both. If this Edward is linked to the CPP manuscript, his associations with the Church of England, both before and after the Civil War, would indicate that the book ended up in a Royalist home. That would be significant, since Calybute Downing, the manuscript’s first compiler, ended up siding with the Parliamentarian cause. The Edward Layfield who became Archdeacon of Essex was nephew to Archbishop Laud, and Joseph Maskell identifies him as vicar of the church at Allhallows Barking on London’s eastern edge (147). We know he fits the CPP manuscript’s story in a significant way: in 1637, he was married to a woman named Ann. According to Maskell’s nineteenth century history of Allhallows Barking, the couple’s daughter, Elizabeth, was baptized in 1637 (68). In 1642, after dissent from a faction of puritans within the congregation, Layfield was “taken into custody as a Royalist and voted unfit to hold any ecclesiastical preferment.” According to the editorializing Maskell, no charges of “moral or intellectual unfitness” were required; “it was sufficient that he was … a friend of the King, and a relative of the Archbishop.” Other churchgoers petitioned on Layfield’s behalf, to no avail. During the Interregnum, he was “confined in most of the gaols about London, and on one occasion, with other clergy, taken on board ship, clapped under the hatches” and purportedly threatened with being sold into slavery (148). 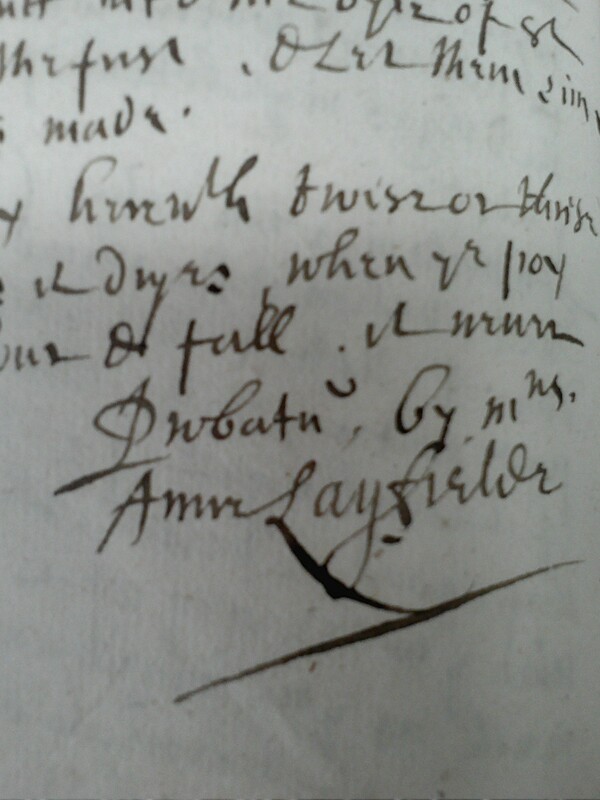 If the manuscript’s Layfield is the archdeacon, though, then we have to wonder what happened to his wife and family during his time in prison. We know the archdeacon’s estate was confiscated, but we cannot immediately tell where his wife Anne lived during his imprisonment. Church records indicate that she died in 1678, and her archdeacon husband died two years later. How does this all come back to recipes? Well, if the Anne Layfield who owned the CPP manuscript in 1640 is the archdeacon’s wife, the book’s history becomes even more remarkable. How would she have gotten the book from Calybute Downing, who died in 1644 while firmly aligned with the Parliamentarians? How would the book have crossed this political divide to end up in a Royalist household? Or did the book follow a friendlier path, moving among friends whose political and religious divisions lay a few years in the future? With luck, more archival research will eventually help us find out. Maskell, Joseph. Collections in Illustration of the Parochial History and Antiquities of Ancient Parish of Allhallows Barking in the City of London. London, 1864. The more Rebecca Laroche and I work with the College of Physicians manuscript, the more enmeshed we become with the religious politics of the mid-seventeenth century. Rebecca’s most recent post, on the transcription of the “Horologe” from Lancelot Andrewes’ Private Devotions, not only provides additional evidence for dating the manuscript in the 1640s, it connects the Layfield hand even more securely to the world of the church. This new context makes our latest discovery even more exciting: we have a new idea of the person behind Hand 2, thanks to a new writing sample from the archives. Looking for potential “E. 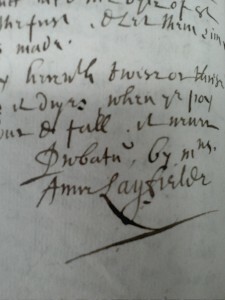 Layfield”s while at the Folger Shakespeare Library, I stumbled across the following image of a signature from the State Papers Online. I immediately knew that I needed an expert opinion. Besides, this new signature belonged to Edward Layfield, Archdeacon of Essex, and Edward Layfield, rector of Wakes Colne from 1640 to 1666, had seemed our most likely candidate. The signatures, moreover, carried the date 1660, and our recipe manuscript’s inscription says the book belonged to a Layfield – Anne – in 1640. But the similarities made it well worth pursuing. I consulted with Heather Wolfe and Sarah Powell at the Folger, and their verdict was a resounding maybe. The idea that the newly-found signatures belonged to the same person as the CPP manuscript’s Hand 2, they told me, was “plausible, but not provable.” They noted that the distinctive h in the letters’ archdeacon does not commonly appear in the CPP manuscript, but they also pointed out that the two new Edward Layfield signatures were different from one another as well, with substantially difference ds. in Layfield. Could Mr. Layfield’s handwriting be changing in his later years? While this verdict from the experts surely didn’t give permission for the “eureka!” I’d been stifling, it wasn’t a reason to stop this new line of pursuit, either. So we’ll be taking it further, to see what difference it makes if we consider Edward, not Edmund, as behind the Layfield hand. Church politics will most certainly be involved. More of that to come in the next posting. Both the Edward Layfield signatures come from The National Archives of the UK, as reproduced in State Papers Online. This first image is For University Promotions or Degrees: Certificate by Edw. Layfield, Archdeacon of Essex, and three others, in favour of the petitioner’s orthodoxy and loyalty (SP 29/9 f.130), and the second is Certificate of Edw. Layfield, Archdeacon of Essex, and two others, in behalf of Rich. Beresford (SP 29/10 f.86).